A racing truck lost control and drove into a crowd late Saturday night during the California 200 Mojave Desert night race, killing eight and seriously wounding at least 12 others. Witnesses describe the aftermath as a "nightmare" scene. UPDATE. 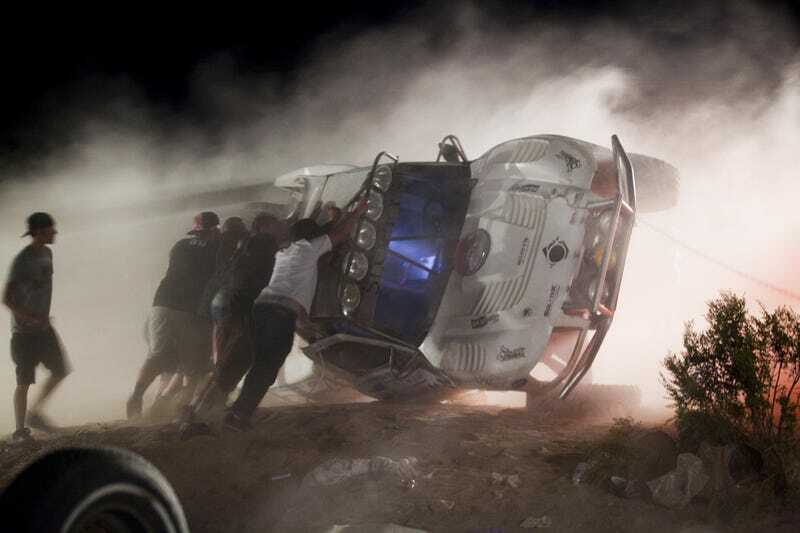 At least eight people are dead and more are in serious condition after a desert racing truck lost control and rolled into a crowd of people last night at the California 200 race, which is a 50-mile loop course around the Southern California desert produced by Mojave Desert Racing. As you can see in the CNN video below, the driver was heading over the "rock pile" section, which involves a jump. There were numerous spectators close to the jump when the vehicle lost control, pinning at least one spectator and possibly decapitating two more. Initial reports mentioned the drivers were uninjured but had to flee the scene because they were being pelted with rocks, but subsequent reports just characterize the crowd as upset. Tyler7 posted that "the Driver did not flee do [sic] to an angry crowd, but in sheer disbelief in what happened he was standing behind us shaking very badly in shock." The driver has not yet been charged with anything and poster Escondido_Tundra at the SoCalTundras, who says he witnessed the event, believes it was purely an accident. The same forum member also mentions a close friend of his was killed in the accident in front of him. There was an enormous EMS response, with vehicles being moved to make room for nearly a dozen helicopters. Patients remain in hospitals at this moment, some in serious condition according to reports. Sports journalist and photographer Matt Kartozian has covered this race before and says it's small, but generally well organized and describes the precautions as standard for this type of event. "It's typical of that race and other races in the area, the snow-fencing is there to keep spectators and people back," said Kartozian. My brother in law was pitting at the race last night and said that the spectators involved in the incident where in an area deemed off limits to spectators but as in most off road races these signs and fences where ignored. Video of the event shows spectators who appear to be well within the 100-foot barrier on both sides of the course. Even if these areas were marked off it's possible there weren't enough marshals to keep people out. Sources familiar with the event describe it as being run by a small group utilizing a large amount volunteer labor. The media response, as exemplified in the video above, has contained numerous references to the proximity of the spectators to the jump. Though this is common in many off-road racing and rallying events, much of the coverage of this incident hasn't included that context and it's likely the impact of this will be to change the way off-road racing is done in the United States. "it's really quite bad and a tragic event, everyone in the community is stunned," said Kartozian. For the moment, those involved in off-road racing are focusing on the victims and trying to make sense of an event of this magnitude, which is the deadliest at a sanctioned event in recent American racing history. Fast-Aid is grieving with the rest of the off-road community in light of last night's horrific accident at the MDR California 200 in Lucerne. Fast-Aid was born out of the need for rapid assistance for the families of racers, crews, photographers and spectators after tragedies such as this. Fast-Aid is partnering with several off-road news and media outlets to coordinate donations to assist the families and more information can be found by visiting our website at www.fast-aid.org. If you are donating specifically to help the California 200 victims, please note "California 200" on your donation and 100% of the funds received will be applied to assisting their families in this difficult time. Andrew Therrinn, 22, of Riverside, CA; Brian Wolfin, 27, of Escondido, CA; Anthony Sanchez, 23, of Escondido, CA; Danica Frantzich, 20, of Las Vegas, NV; Zachary Freeman, 24, of Fillmore, CA; and Dustin Malson, 24; of Ventura. According to witnesses, Therrin pushed two children out of the way of the truck before being struck and killed.